The Red Demon was the first high powered evil being Dan and his friends ever took on. This happened shortly after Dan gained his powers. The demon was born through one of Dan's friends, Brian, and Brian was almost killed in the process. Dan and his friends thought they killed the Demon in this form, and in doing so, Brian was lost too. But the Demon returned more powerful, now seperated from the mortal body he had been trapped in. An ultimate battle took place on the football field of Dan's high school, and ultimately, Dan and his friends defeated the Demon with the help of the returned-to-life Brian, sporting demonic powers of his own. Red Demon Death number 1. The Demon returned later that year to get his revenge, even killing one of Dan's friends, and then ressurecting him to be his slave. Ultimately Dan's friend was rescued, and Dan fused with his 2 friends Cheeks and Al, to form an ultimate fighter, Cal. Together as Cal, they destroyed the Red Demon. Red Demon Death number 2. His most recent appearance was in the recent Void City Death-Match Tournament, where, after ruthlessly killing several opponents, he allowed himself to be finished off by the evil cyborg Shredd. Red Demon Death number 3. Why the Demon allowed himself to be killed so easily is not yet known. What is known however is that Dan, now one of the most powerful fighters in Void City, disappeared around the same time that this happened, and no one knows why. Shortly after being discovered as Dan's fill-in in the recently finished Tag Team Tournament, Toast disappeared as well, presumably to find Dan, and put answers to both of these mysteries. 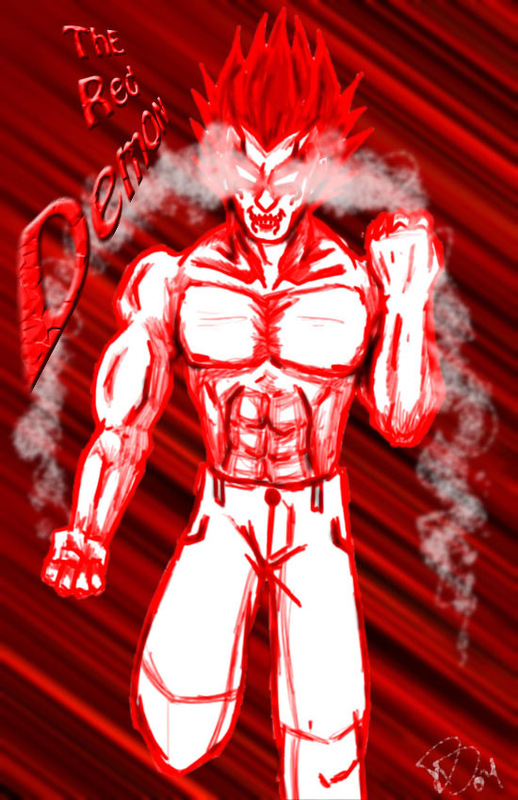 The late Red Demon's demonic powers included flight, super strength, the ability to sommon small demon creatures at will to aid him, form and throw large energy blasts of red energy, and the ability to take fallen victims, and ressurect them to use as slave fighters against his enemies.